Nigerian universities have been buffeted with agonising months of strikes for over a decade and until now, the story is pretty much the same. Government is still unwilling to give the education sector a shot in the arm. 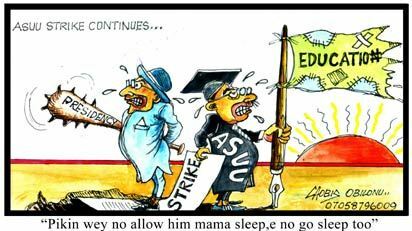 Academic Staff Union of Universities, ASUU, have been on strike since June 30 and has dialogued with FG over 11 times, albeit, inconclusively. This underscores the lukewarm posture of government towards the striking lecturers and from ASUU’s body language and utterances, they have made it abundantly clear to anyone who cares to listen that they are ready to continue the strike even if it takes years, insisting that their decision was adequately taken in a bid to revitalise Nigerian universities. The bone of contention is lucid in itself. An agreement was reached in 2009 that all federal universities would require a total sum of N1.5 trillion spread over three years (2009-2011) to address the rot and decay in the universities. But, in the Memorandum of Understanding, MoU, signed between the union and the government in 2012, FG decided to extend the gesture to include both federal and state universities. After the 2012 review, it was agreed that instead of N1.5 trillion, FG would infuse a total of N1.3 trillion into the universities over four years. Almost four years down the line, FG has refused to fulfill its end of the bargain. Rather than respond to the issues raised by the union that would ensure quick resolution to the imbroglio, government boycotted ASUU to summon a meeting with Pro-Chancellors and Vice-Chancellors of universities, offering them N130billion with a matching order to lecturers to resume work immediately. But the union is insisting that by throwing money at universities in that manner, government has repudiated the 2009 agreement it entered freely with the union and the 2012 MoU. ASUU is not making any fresh demand but has maintained that the 2009 agreement must be honoured. It is ridiculous that government officials were quoted as saying ASUU’s N1.3 trillion demand is capable of shutting down the country. No. Their insatiable and rapacious greed will. The private jets in the presidential fleet can fly, centenary celebrations is a priority to government, there’s enough money to pay humongous salaries and allowances to federal legislators and other political office holders, enough to forfeit to oil subsidy thieves, enough to pay militants bogus amnesty cheques and phantom contracts while they continue to bunker our crude oil like never before, there’s enough money to beg Boko Haram to accept amnesty but there is no money for law abiding Nigerian students who want to eke out a living using university education as a stepping stone. It is this kind of attitude from the government that provokes the use of brute force by some regional groups to attract government’s attention to their problems. Government cannot claim it has no money to fulfill this agreement. A country with 109 senators earning about N19.6 billion a year, while N51.8 billion is spent on members of House of Representatives for the same period, totaling N71.4 billion. This sum, N71.4 billion, represents 17.8 per cent of the N400bn yearly intervention fund recommended by the Committee on Needs Assessment of Nigerian Universities. Surely, our lecturers and universities where they were trained deserve more. When we talk of heath care, government official and the ruling elite go abroad for medical attention; we talk bad roads, they fly private jets; we talk power, they run their homes on 24-7 alternative electricity source; now we’re talking Education, their wards are in some of the best universities abroad. There is no way the myriad of problems bedeviling the country can be tackled if the political elite don’t feel the pangs. That Mr President has taken out time from his ‘busy’ schedule to constantly parley with the warring factions of his party, PDP, but has never sat down with ASUU members to chart a course for Nigeria’s leaders of tomorrow clearly shows his priorities. Party affairs and chasing perceived enemies of his 2015 ambition around with apparatus of state are far more important things than bending over backwards to pander to the demands of the striking lecturers. But then, government must take into cognisance the fact that, the longer the students remain at home, chances are that they will be lured into social vices. The aftermath can be disastrous for the state. There are misplaced calls in the some quarters for ASUU to be ‘reasonable’, accept FG’s offer and return to classrooms. Others lambast them for being self-centered and unpatriotic. It is unfortunate that Nigerians are always looking for quick fix solutions to monumental problems. Less endowed countries like Ghana, Botswana and Angola are making giant strides on all fronts because the citizenry have at one point or the other insisted that the needful be done. Here, anything thrown at us is accepted with glee. We must get our priorities right as a country. Government must curb its own excesses. Education must be given the attention it deserves. Education of the citizenry should not be subjected to any form of Negotiation. Negotiating the education of our leaders of tomorrow is more or less negotiating the future of the country. Government deliberately wants the strike to linger, first, to blackmail the opposition. There have been several unsavoury comments from the government’s divide of the negotiation table that ASUU has been infiltrated by moles from the opposition, alleging that the strike has lingered to gain political capital. That is how low this government can stoop. We have seen it before. It is an irresponsible and shameless government, one that lacks integrity and honesty that will blame the opposition for all its woes. It is unbecoming for the government of the day to continue to heap its failure on the doorstep of the opposition and ASUU strike is just another avenue to paint the opposition black before the public. Second, is to send a strong signal to other unions who might be contemplating similar action to have a rethink. Perhaps, government thinks by acceding to ASUU’s demands, other Labour unions might toe the same path at the slightest excuse. Third, the ultimate aim of government is to paint a bad image of the association to Nigerians, at least, for as long as the strike persists. The Governor Suswan-led NEEDS Report Implementation Committee mediating on behalf of the government has unfortunately taken a position that is false, dishonest, and calculated to misinform the public and cause disaffection towards the union. Rather than seek cheap popularity, Governor Suswan and the rest of the FG team should tow the path of honour by asking President Goodluck Jonathan to honour the 2009 agreement. There’s no basis for turning the heat on ASUU and the campaign of calumny. Again, we must get our priorities right as a country. Government must curb its own excesses. It calls for worry, that the same government that has always maintained that ‘our graduates are unemployable’ and our universities churn out ‘half-baked graduates’ find it difficult to commit the much needed funds to revamp the universities.